My friend Jen writes Something Turquoise and I just had to share it with all of you! So, yeah, I’m not planning a wedding, but I go over there just to be inspired. I may already be married, but that doesn’t mean I never throw parties, or want to see pretty pictures! For example, look at this photo she posted from a wedding reception... I don’t care what you’re planning. Jen also has fabulous tips and do cute DIY projects. She just did the most simple, sweet GENIUS idea for chocolate tasting. How cute is this?! How fun would this be at your next Girls’ Night? Or a Baby Shower? Or as a party favor? I’m loving this idea! or maybe a simply gorgeous flower arrangement using scotch tape and a Trader Joe’s ready made bouquet…? In addition to all of the fabulous DIYs she shares, she features her favorite etsy shops, ideas for party favors, pinterest inspiration boards and beautiful photography. Please go visit her… but be warned: you’ll get over there and be scrolling through all of the eye candy that is there and probably pinning away like crazy. I pinned several items just putting together this post. Remember, even if you’re married, it’s OK to look at wedding inspired blogs. Viv – you are the best! Thanks for the blog love!!! The chocolate tasting jars will make great party favors and I will definitely use the scotch tape idea! Thanks for the tips…or showing us Jens! Ding, ding…that is a great blog. One day Rondell and I will renew our vows and I’d love to do something simple & classy. 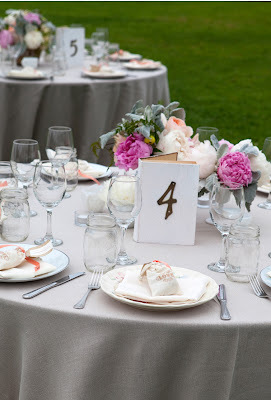 I love the mason jars and the book to number the tables. Where was the seating chart tip when I was planning? Thanks for sharing. I too still look! And I shop wedding dresses too! Ha! I love, love, love that chocolate tasting idea! I love little jars and making gifts out of them.